When I first saw the ad for this video on Facebook, I thought, Meh. It’s for a soap company. I’m sure it’s silly. 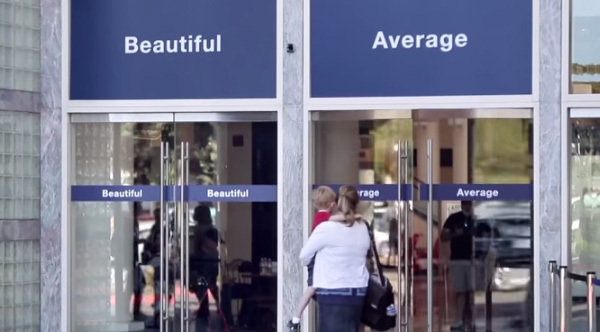 Yet the image was of a woman standing in front of two doors, one labeled “Beautiful” and the other labeled “Average.” The main reason I clicked on the video was because I had to know which door she chose. But as I watched, I realized this commercial for Dove was getting at something very important, something that didn’t have anything to do with soap. The central premise revolves around a question we are confronted with every single day, and the way we answer it will determine a lot about our lives. Every day we’re asked similar questions, in different ways. Every day we have to decide if we are beautiful or average, intelligent or average, creative or average, handsome or average, funny or average, a talented writer or average. Beloved or average. Every day. Take three minutes and watch this video to see how these women answered the question. Check out the look on the faces of those who finally label themselves as beautiful – I don’t know about you, but I see relief, joy, and a childlike giddiness. Why did this video clip make me cry? it is constant, I have people tell me I am pretty, but it never really sinks in. I am working on it because I am raising a teenage girl and she is beautiful, and I already see the struggle. She picks herself apart and compares herself to friends and it breaks my heart. That was powerful. Thanks for sharing. I love this – a brilliant campaign, on multiple levels. And I get both decisions. Thanks, Shawn – really interesting. You know all God’s children are beautiful because we bear His image, but so many of us stick with the labels the world gives us instead of believing the truth of what He says. I have to admit some years ago I would have chosen the average door too, but now, I think I would pick the beautiful one … maybe not even because I feel it, but because I have in the last years tried very hard to align my thinking with His instead of living in doubt, fear and hopelessness. I would encourage all believers to do the same. Listen to the voice of your heavenly Father who says that You are His beautiful creation… totally accepted by Him through Christ… and fully loved! thanks to you and to Dove.